Rule The World wins the Grand National for Mouse Morris in the hands of David Mullins, the horse's first ever win over fences! Victory for Rule The World in Michael O'Leary's Gigginstown House Stud colours came a month after his Don Cossack had landed him the Timico Cheltenham Gold Cup. Rule The World, trained by Mouse Morris, was a maiden over fences, but O'Leary explained: "He's always been a very good horse, but he has had two pelvic injuries and has been off the track for two years. We've been running him in graded races and he's been performing very well. This was only my second runner in the race [although he also had two other runners in today's contest] - we ran another trained by Mouse, Hear The Echo, about six or more years ago after he had won the Irish National the year before. This is an incredible achievement by Mouse to bring a horse back to the track after two pelvic injuries, and to win the world's greatest race over four and a half miles in soft ground shows the genius that Mouse is. He has always been a trainer for the big day - he doesn't have a huge number of horses, but the ones he has look incredibly well, and if he would only get his hair cut he could have a great future! "There's no comparison between this race and the Gold Cup. Our aim has always been to win graded races, and they tend to be badly handicapped because they try their best to win those races. I was very relaxed all the way round today because I didn't expect to win it. First Lieutenant fell early on and Sir Des Champs [who also ran in his colours] went at The Chair, but Mouse and his able assistant, his son Jamie, had this horse right and David Mullins [the winning jockey] for a young man rode a great race. He nearly fell off coming over Becher's on the second circuit, but never panicked and was very cool. It seems to be a feature of most of the Mullins clan, whatever it is they breed into them in Kilkenny, that they are very cool and collected. "We've had horses for ten or 12 years, and I've learned from J P McManus over the years that you need the numbers and you end up with a few good ones. It costs a lot of money, but when you win your first Gold Cup it's worth it, when you win your second Gold Cup it's worth it, and when you win an Irish National it is, but I never thought I'd win the Grand National. J P wins the National." Asked about Rule The World as a character, Morris said: "When you consider the injuries he has been through you can only call him a horse of iron, but a pure gentleman." Grade 3, £1,000,000 Total Prize Fund. Four miles, three and a half furlongs. It was a case of what might have been for jockey David Bass and trainer Kim Bailey after The Last Samuri, 8/1 joint-favourite, finished six lengths runner-up to Rule The World after a dream run. "He's run an absolute blinder," said Bass. "I can't fault the horse, he's as brave as a lion. I'm just gutted to finish second. He travelled, he jumped, we fought off the third horse and it's just gutting to be beaten by one. I thought going to the Elbow that if we just kept going we might finish with a wet sail. Anyway, hopefully next year." Trainer Kim Bailey added: "There's only one place you want to be at Aintree and I was lucky enough to be there with Mr Frisk. I hate being second, I can't even explain the feeling. "He travelled brilliantly through the race, the rain wouldn't have helped but what a great run. He never made a mistake the whole way round. I hope we haven't had our share of winning and it will be our turn next year." Jockey Robbie Dunne made a miracle recovery aboard third-placed Vics Canvas (100/1), eight lengths further back, after all but coming off at Becher's first time around. "I was terribly unlucky at Becher's the first time," said Dunne. "I don't know how I stayed on him. It took him a while to get his confidence back, I just had to creep, creep away. I was fairly sure coming to the Elbow that I was going to win so it was bit disappointing. "Everything else went fine apart from that one mistake. I nudged him back into it, he got his confidence back and I just waited as long as I possibly could. I thought he would stay a bit better than he did. But obviously he's quite a small horse and it's very testing ground. That's racing." Vics Canvas's trainer Dermot McLoughlin added: "It was unbelievable how Robbie came back from that mistake, they were very unlucky at Becher's. They must have lost 20 lengths, the horse tried very hard and it was a great run. Robbie was understandably very disappointed afterwards. "It was the first time he'd had a low weight like 10st 6lb on his back, he's much better with a light weight so we were quite hopeful beforehand." Leighton Aspell, rider of last year's winner 8/1 joint-favourite Many Clouds who finished 16th and last, said: "It was possibly the ground that found us out it was quite tough out there. I thought I would get further before the going became an issue." Nina Carberry, on Sir Des Champs, said: "We had a circuit to go so I don't know where we would have finished." Andrew Lynch, rider of Home Farm, said: "He was never going on the ground." Trevor Whelan, onboard The Romford Pele, said: "He just got in a bit deep - it was a great experience until then." Barry Geraghty, on Shutthefrontdoor, said: "He ran a great race - he jumped he travelled but he just wasn't good enough on the day." Paul Townend, on Boston Bob, said: "I had a good spin of him until Be`cher's where I pulled him up. The ground was probably against us." Ryan Hatch, on Double Ross, said: "I had the most amazing spin, unfortunately at the Canal Turn the second time my tack slipped, I jumped one without any irons and then had to pull him up. 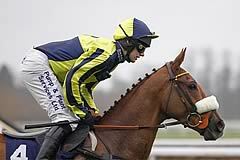 I am gutted, my first ride and the horse was absolutely brilliant and really looked after me." Nick Schofield, partner of Unioniste, said: "Unfortunately half way round he was hit quite badly and he had to get his confidence after that, he would have been better on better ground." Harry Skelton, partner of Le Reve, said: "It was brilliant, he enjoyed every fence and really took to the race." Aidan Coleman, rider of Pendra, said: "He jumped well but just didn't get home in the ground." Sam Twiston-Davies, on Wonderful Charm (PU 24th), said: "Yea it was grand, he jumped really well. It was probably just a bit soft for him. He'll be back next year." Tom Scudamore, on Ballynagour (UR 19th), said: "I had a good ride round, he made a mistake at the ditch. I would have got away with it at any other fence but not the ditch." Jeremiah McGrath, on Triolo D'Alene (14th), said: "That was great, popped round on my first attempt so very happy. We knew he wouldn't like the ground so I rode him accordingly." Paul Moloney, rider of Buywise (12th), said: "The ground was too soft and the trip found him out as well." Jonathan Burke, partner of Goonyella (5th), said: "He didn't miss a beat. He jumped beautifully, the jumping kept him in it. He gave his all to start to finish. From four out I thought we were going to get close. But gave his all and ran a blinder." Mark Walsh, on Gallant Oscar (UR 18th), said: "I was still going well, he just got in to tight and I went straight over his head." Sam Waley-Cohen, on Black Thunder (PU 21st), said: "He was going well for a time. He just got very tired and then the mistakes started creeping in. It was hard work out there." Katie Walsh, rider of Ballycasey (UR 29th), said: "He was going well, I'd say he didn't appreciate the softer ground." 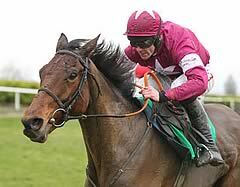 James Reveley, partner of Vieux Lion Rouge (7th), said: "He jumped like a boat got a great run round. He was going well enough three out he just didn't quite stay the trip." Paddy Brennan, on Saint Are (PU 30th), said: "It was just the ground. He jumped well for a circuit and I knew when we went out on the last circuit he didn't want to go really, he just wasn't happy." Trevor Whelan, on board The Romford Pele (UR 8th), said: "He was going well, he just got in too close to the Canal Turn and that was it." Richard Johnson, on Kruzhlinin (PU 21st), said: "I never got into the struggled on the ground." Denis O'Regan, partner of The Druids Nephew (PU 21st), said: "It was a super ride but he just didn't go on the ground"
Davy Russell, who rode Morning Assembly (8th), said: "I got a great ride. He jumped so well, he got me in a false position after the third last. I was trying to fill him up but it just wasn't to be. He didn't really see out the trip but it was the best spin I got over the fences. "I moved him out to get a clear view. He wasn't jumping as well behind horses and when I moved him out he pricked his ears and was winging fences." Patrick Mullins, on On His Own (Fell 15th), said: "I was going very well. The plan was to drop out and I was just working my back in when we came to The Chair. He put his front feet into the front of the fence and that was that. He has run three times with three different jockeys and had three falls so maybe it just isn't for him." Andrew Thornton, rider of Rocky Creek (PU 12th), said: "He didn't really enjoy it."